Don't get us wrong: The 2018 Volkswagen Golf GTI is a fast machine. In many respects, it's faster than its performance and price-point rival the 2018 Subaru WRX. But what really elevates the 2018 Volkswagen GTI above its peers isn't performance, power or German engineering — though it does have those. As a daily driver, for getting too and from work, carrying your stuff and filling up at the pump, the 2018 Volkswagen Golf GTI is far and away the more practical performance car. See how much more utility and capability you get from a GTI at Carter Volkswagen in Ballard, serving Seattle and Redmond. Visit our world-class showroom any time or schedule a test drive in advance online. Once you do, we're confident you too will prefer the 2018 Volkswagen Golf GTI over the 2018 Subaru WRX. Before you even turn the ignition, the GTI has a leg-up on its rival: The 2018 Volkswagen Golf GTI weighs more than 200 pounds less. Yet inside, the practical, efficient hatchback design means you get more than four times as much storage space with the rear seats down as you can have in the sedan-based 2018 Subaru WRX. Passengers will thank you for the extra leg- and headroom in the rear seat compared to the WRX. Beyond sheer capacity, you also get way more standard features in a base 2018 Volkswagen Golf GTI, including LED foglights, taillights and daytime running lights, powered and heated seats, plus automatic, rain-sensing wipers. Volkswagen gives you all of that for just a little bit less than the cost of a base 2018 Subaru WRX. Both the 2018 Volkswagen Golf GTI and Subaru WRX achieve 60 mph from zero in less than six seconds — but, outside of a drag race, the Golf GTI is measurably superior in every way. The 2018 Volkswagen Golf GTI moves from 50-70 mph faster, stops shorter, and corners quicker than a 2018 Subaru WRX. Car and Driver's skidpad handling test rated the GTI higher than the WRX, and the magazine said of the Volkswagen, “The GTI reacts to steering inputs so quickly and accurately that you'll think the car is becoming a sentient being.” And lest we forget, all that performance doesn't even come at a fuel premium — you'll get an additional 5 combined MPG on the 2018 Volkswagen Golf GTI compared to the 2018 Subaru WRX. Volkswagen and Subaru have wisely offered both their performance cars with plenty of active safety features. You can have Blind Spot Monitor, Light Assist, Lane Assist, Front Assist with Pre-Collision Braking and Pedestrian Monitoring, plus Rear Traffic Alert on your 2018 Volkswagen Golf GTI. 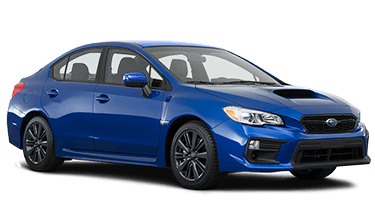 Similar features are also available on the 2018 Subaru WRX. However, only the 2018 Golf GTI boasts Volkswagen's exclusive Post-Collision Braking, which ensures your vehicle comes to a complete stop after a crash, rather than let momentum carry it into danger. You also can't have Park Assist with Park Pilot on a 2018 Subaru WRX. When properly equipped, a 2018 Volkswagen Golf GTI will measure a parking space, make sure it can fit, and practically park itself.